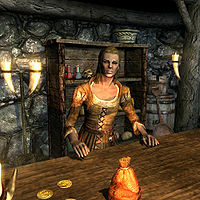 Birna is a Nord pawnbroker who runs Birna's Oddments in Winterhold and feels depressed about how little custom the shop has; her only regular customer is the housecarl, Thaena, who isn't the most friendly person. Her brother, Ranmir, has a tendency to drink away their earnings. Birna wears a belted tunic and a pair of boots. She is equipped with an iron dagger, and carries a key to Ranmir's house as well as a selection of common items and gold. Since Ranmir spends much of his time drinking inside the Frozen Hearth, Birna must dedicate most of her time to running the store in order to support both herself and her brother. She wakes up at 7am and unlocks the door to the store. She will then stand behind the counter in the store for the next thirteen hours, offering her services between 8am and 8pm. After a busy day of running the shop, she will leave at 8pm to head to the Frozen Hearth. She will find a seat and eat and drink with the other regulars for the next three hours. At 11pm, she will make her way back home. She will stay up for another hour, until heading upstairs to sleep for the next seven hours. Approaching Birna will have her inform you that almost everything she has is for sale: "I'll sell just about anything, if it's worth my time. Keep that in mind, will you?" She will also make frequent comments of her issues with her brother: "I do what's necessary so we can get by. Have to, since I can't count on my brother for anything." "If you're looking for Ranmir, he's either passed out in bed, or working on winding up that way." "My brother's a good-for-nothing drunk. We'd have lost the house by now if it were up to him." "Just because we live in the middle of nowhere doesn't give Ranmir the right to drink himself into oblivion." "Ranmir has no problem drinking himself under the table, so I have to be the one to make ends meet." If you assist Ranmir stop drowning his sorrows, she will instead make a series of comments about how her life has been improved now that her brother isn't drinking her profits away: "Things are easier now that I don't have to worry about Ranmir anymore." "I still can't believe you were able to help Ranmir pull himself together." "Without all our money going to drink, I can afford to expand my selection a bit." Speaking to Birna will allow you to ask her why would she would set up her shop in the middle of a troubled town, to which she will explain it is not her preferred situation: "Wasn't by choice, I can tell you that. Options were in short supply. Ranmir and I grew up here, and nearly any money I make, he drinks away. Without the coin to pack up and leave, I decided to take to trading." Asking her about how her business is doing will have her scoff at the remark as if it was a bad joke: "Very funny. I'm sure you've noticed that Winterhold isn't exactly overflowing with people. So I'll sell whatever I can. If it's worth putting a price on, you can bet I'll do it. I've been burned a few times, made a few bad deals, but mostly I come out on top." If you ask her if she has ever had a bad deal after asking about her business, she will explain how she came to possess a seemingly useless dragon claw: "Yeah, it was stupid of me. I shouldn't have believed the story and just refused the trade. But I didn't, and now I'm stuck with this worthless junk." Asking her what the story was will have her explain it: "Some line about this claw thing and Yngol Barrow. He said it was worth more than its weight in gold if I took it back there. Something about placing it back in Yngol's chamber, I don't know. What was I thinking? Even if it were true, I'm not setting foot in some ancient tomb, filled with who knows what." Telling her you would be interested in investigating this story will have her offer to sell you the claw: "I don't even care any more. You want to check it out? Fine. I'll sell you the thing for fifty gold, and then it's your problem." If you try to buy it from her without enough money, she will say: "Oh, I'd gladly sell it to you if you had the money. But you don't, do you?" If you do have the required amount of gold, she will give you the dragon claw: "Fine, here you go. You get killed on account of this thing, it's not my fault. Got it? But, I suppose, if it does actually turn out to be worth something, let me know, will you?" Despite this request, you cannot inform her of the true treasure the claw protects. Birna: "How are you today, Thaena?" Thaena: "Same as ever. Trying to keep from freezing to death, trying to keep food on the table." Birna: "Always looking on the bright side, aren't you." Thaena: "Don't sass me, little girl." Thaena: "You got anything in here worth buying?" Birna: "I certainly hope so, otherwise I'm wasting my time." Thaena: "Yeah, well I don't see anything." Birna: "You looking for anything in particular this time?" Enthir: "Perhaps, perhaps. I'm not quite sure what I need." Birna: "Well, you know the drill. You don't see it here, it's gonna cost you extra for me to get it." Enthir: "I'm fully aware of the terms of our... arrangement." Enthir: "Have you gotten the items I requested from you?" Birna: "Not yet. You know you're asking for some pretty strange stuff, don't you? It's not easy to find." Enthir: "You assured me that you could find it, however." Birna: "I did, and I will. It's just tougher than I thought." Birna: "Well, isn't this a surprise!" Birna: "How much of our money have you spent today, Ranmir? Anything left, or is it all gone?" Ranmir: "If I wanted to get yelled at, I'd be home. Can't you leave me be?" Birna: "Oh, I'm sorry. Am I bothering you? Am I making your life more difficult?" Ranmir: "Can't. Got at least two rounds to go." Ranmir: "Why don't you go... sell something." Dagur will also suggest you visit her shop if you ask him for information about Winterhold: "I'm afraid there's not much to be said. Winterhold is hardly what it used to be. You can talk to Birna if you need to buy anything. She doesn't have much, but could certainly use the coin. And then there's our little inn. Most of the business we get is from folks here to visit the College, though even that's dried up some." Birna may just stay outside with Ranmir while in Winterhold, negating the option of trading with her. See the discussion page for details on possible workarounds. This issue has been addressed by version 1.3.0 of the Unofficial Skyrim Patch; the navmesh inside the shop was bad, preventing her from using the door. Birna's dialogue after the end of Drowned Sorrows doesn't change to mention that Ranmir is gone. She was supposed to expand upon her previous response if asked about why she set up shop in Winterhold after the quest was completed: "Wasn't by choice, I can tell you that. Options were in short supply. Ranmir and I grew up here, and his drinking soaked up whatever coin we had. So I opened a shop to try and get by. Now, though... Have to admit, I'm attached to the place. Suppose that makes me crazy, doesn't it?" There was nothing put in the scripting to allow the updated line to be said. If the player buys the Coral Dragon Claw off Birna and then speaks to her again when they have less than 50 gold, Birna will have dialogue offering to sell the claw again as if she still had it. This bug is fixed by version 4.1.6 of the Unofficial Skyrim Special Edition Patch. This page was last modified on 18 December 2018, at 04:17.